When people ask me how to decide between Muotka and Nellim I find it very hard to give them an answer as they are both such wonderful destinations. Now I no longer need to worry as this trip combines both to create an exceptional seven-night holiday. 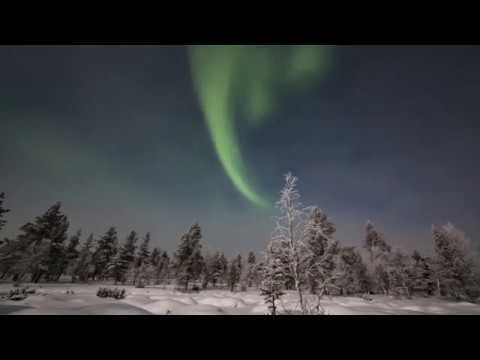 If you are torn between the two then look no further than this Great Aurora Adventure. This trip combines two of our best-loved destinations in one epic Aurora hunting week. 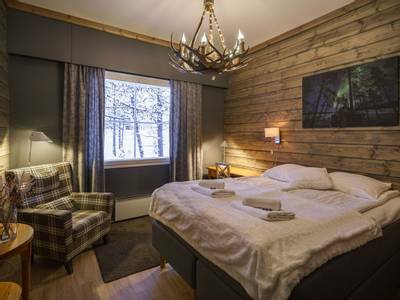 Starting in the stunning Wilderness Hotel Muotka before heading to remote Nellim, exceptional winter activities fill your holiday in areas with outstanding Northern Lights records. Transfers: return airport transfers are included as well as a transfer from Muotka to Nellim. 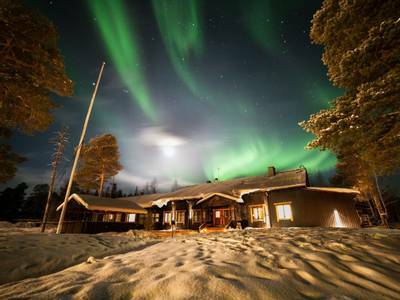 Wilderness Hotel Muotka and Wilderness Hotel Nellim, are two of our most popular Northern Lights destinations. Each hotel offers guests something special, and many people have found it hard to choose between the two destinations. This holiday means that you do not have to make that choice as both locations are combined in one unforgettable week. When it comes to activities and Aurora hunting, both hotels are at the top of their game. Both sit in remote areas, far from light pollution, both offer guides with extensive local knowledge and Aurora expertise and both offer innovative Aurora accommodation options. 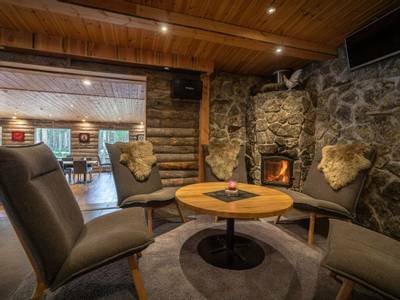 Your holiday will start at Muotka, where you will enjoy the total seclusion of the hotel and the peace and quiet which accompanies this location. 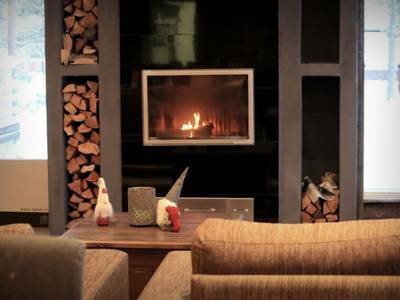 Surrounded by forests and fells, the hotel is the ideal base for activities. Here you will explore the landscape on snowshoes and cross-country skis (the region is renowned for its ski trails). Guests will also encounter reindeer following a snowmobile safari to a local reindeer farm. Your evenings at Muotka are filled with Northern Lights viewing opportunities. Expert guides will lead the hunt as you travel to a specifically chosen Aurora Camp and explore the forests on foot during a guided snowshoe hunt. After four nights at Muotka it is time to head to Nellim. 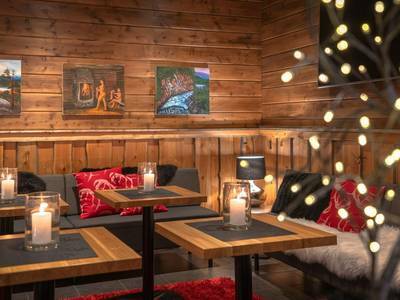 En-route you will detour to Inari, the heart of indigenous Sámi culture in the region, where you will visit the fascinating Siida Museum before continuing to Nellim. The landscape around Nellim just begs to be explored and at only around 9 kilometres from the Russian border, this is real wilderness! You will head out on snowmobiles for an adventure before the all-important husky safari where you will take control of your own team of dogs. 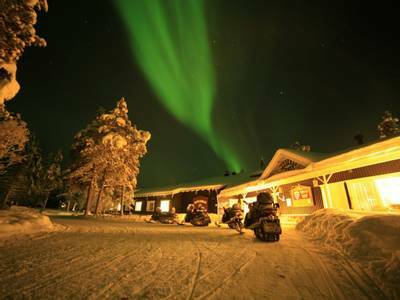 At Nellim, you will also enjoy a visit to an Aurora Camp, travelling by snowmobile-pulled sleigh. This holiday is already special, but if you fancy adding further finishing touches then you can do so by taking advantage of some of the exceptional overnight experiences which are available. 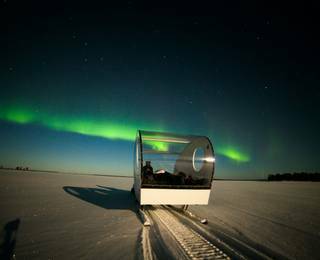 You can spend your time at Muotka in an Aurora Kota - enjoying the benefits of your own cabin style accommodation with a glass tepee roof above your bed, ideal for watching the Aurora from the comfort of your duvet! You can also enjoy the wonder of the Aurora Bubbles at Nellim. These incredible stand-alone rooms have transparent domes above the beds and enable you to keep an eye on the skies throughout the night. Details of all these unforgettable options can be found in the 'Accommodation' and 'Personalise' sections of the holiday page. The activities outlined will all be included in your holiday, however, the order listed is for guidance only, and your agenda will be confirmed on arrival. Upon arrival, you will be transferred* to Wilderness Hotel Muotka, your base for the first four nights of your holiday. Dinner will be served in the hotel restaurant this evening and you can enjoy your very special new surroundings. * Transfers are based on a scheduled group shuttle which sometimes makes stops at a couple of hotels in nearby Saariselka. If you would prefer to upgrade to private taxi transfers, please ask our Travel Experts for a quotation. The order of the activities listed in this agenda is provided for guidance only, your activity timetable will be provided on arrival. 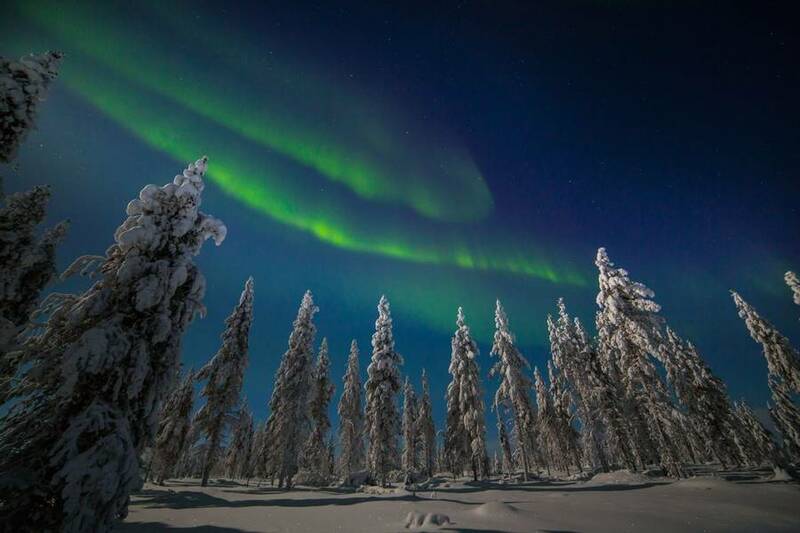 Your adventure at Muotka will begin with an Aurora workshop which will be hosted by one of the expert guides. It will give a simple overview of the science behind the Northern Lights and will advise you on what to keep an eye out for during your hunts. Your first foray into the wilds is designed to introduce you to the stunning natural environment which surrounds the hotel. You will be guided on a snowshoe hike through the forests and your guide will point out any local flora and fauna as you explore. Lunch will be served around an open fire (weather permitting) and you will be out for around 4 hours in total. Dinner will be served at Muotka tonight before your inaugural hunt for the Northern Lights. 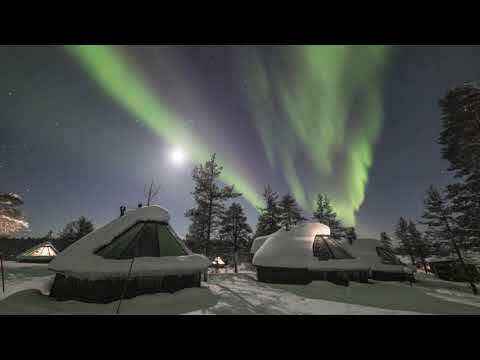 The Aurora Camps around Muotka have been chosen specifically for their views of the skies. You will travel to the selected camp in a sleigh pulled by the guide’s snowmobile. A campfire will be lit, and you will commence your Aurora stakeout. Should conditions be favourable, you will be in a prime viewing location. In total you will be out for around 2.5 hrs. Snowmobiles are a vital part of the local economy and ensure that remote communities can stay connected, even reindeer herders have benefitted hugely from them as they track down their herds each day. Snowmobiles are also hugely popular with local people from a leisure perspective and today you will see why during your first snowmobile safari. Your guide will give you a full safety briefing and instruction on driving the snowmobiles before you set off on the trails. Your destination is a local reindeer farm for an encounter with these delightful animals and the chance to meet the herder. Here you can enjoy learning about one of the most remarkable ways of life in Europe and the importance of the reindeer to the region. A short reindeer-pulled sleigh ride is included, and you will also be shown how to use a traditional lasso. A warming soup lunch will be included during your activity. 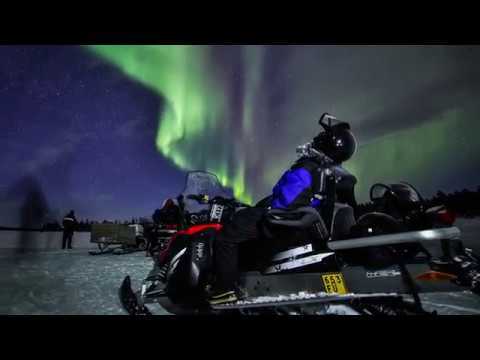 You will return to Muotka on your snowmobiles after a wonderful set of experiences. 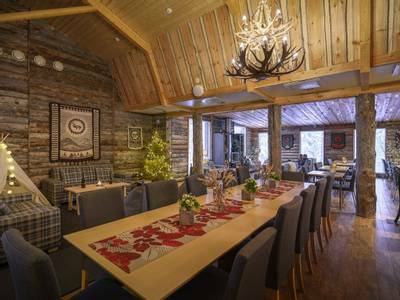 Throughout you’ll be travelling two people per snowmobile and will have the chance to swap drivers at the reindeer farm (any driver must be over 18 and have a full driving licence). The activity lasts around 4 hours in total. After dinner, you will set out on the trails with your guide, using only headtorches to light your route. 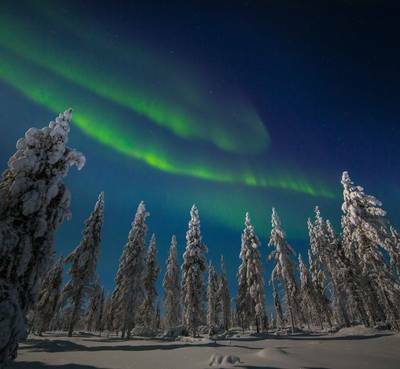 Your Aurora snowshoe hike will lead you into a prime Northern Lights location. Here you will enjoy a break around the campfire and watch the skies for a potential display. In total you will be out for around 2.5 hours. The distance travelled on snowshoes varies depending on conditions. This area is renowned as one of the best places in Finland to enjoy cross-country skiing and the sport is hugely popular in Finland. It is your turn to see what all the fuss is about. No previous experience is required as you will be given full instruction from your guide as you ski along the tracks, exploring the forests and taking in the sights. This sport can be very addictive however and so you can hire skis at either Nellim or Muotka should you wish to continue to explore independently. The lesson lasts around 2 hours in total. This evening you are free to do as you wish. 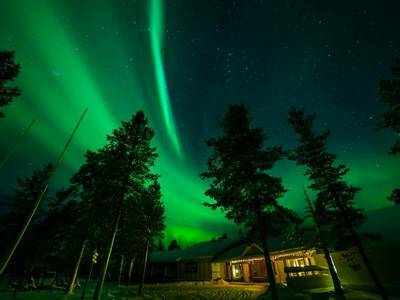 The beauty about Muotka is that should the prospects of an Aurora be high, you rarely need to venture further than the hotel’s grounds in order to witness them. 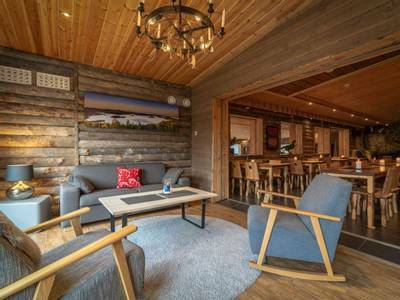 You may also like to spend the night in one of the incredible Aurora Kotas which are available at Muotka – details can be found in the Accommodation and Personalise sections of the holiday page. (please note that as the final order of activities will be confirmed on arrival, the kota cannot be guaranteed to be booked on your free night, but you’ll still be able to enjoy plenty of time in the accommodation after any activities). This morning your time at Muotka has come to an end as you will check out ready for the next stage of your holiday. Before heading to Nellim you will visit the small village of Inari (around 1.5hrs from Muotka) to visit the Sámi Siida Museum which is the centre for Sámi culture in Finnish Lapland. The museum is very well known for its permanent exhibits on local wildlife and photographic displays detailing the rich and varied history of the Sámi people and their role in modern day Lapland. The museum also has a wonderful gift shop selling an array of handmade products which make wonderful souvenirs. 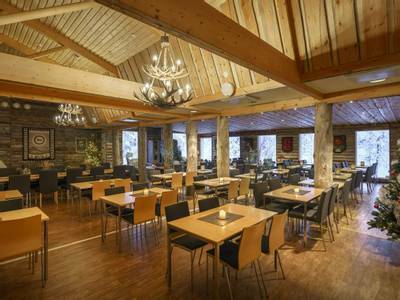 Lunch will be served at Wilderness Hotel Inari, sister hotel to Muotka and Nellim. After lunch, you will take the road to Nellim (around 1.5hrs drive), travelling along the edge of Lake Inari. The trip will give you a sense of how big this lake is, as you will still be following its shores when you arrive at Nellim. 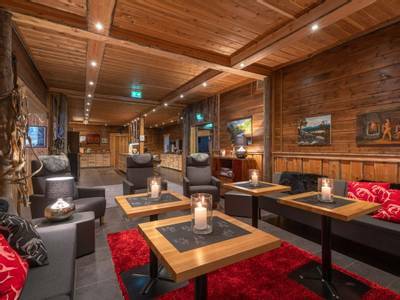 On arrival at Nellim you can check in to the hotel and enjoy an evening meal in the restaurant. This evening we recommend taking a short walk down to either the small lake right beside the hotel, or the frozen surface of Lake Inari (a few minutes away), both of which are exceptional Aurora viewpoints. These locations are where many members of our team first saw the Northern Lights. The scenery around Nellim is just begging to be explored. 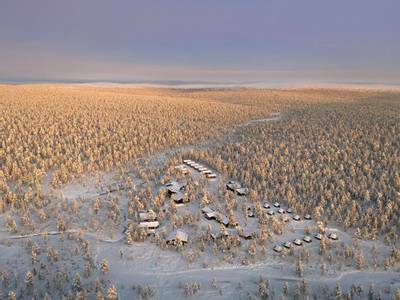 Shaped by the huge frozen expanse of Lake Inari, surrounded by dense forests and only nine kilometres from the border with Russia, the area really feels wild and wonderful. Snowmobiles offer the best means of getting to grips with the scale of the wilderness here and today you will be back out on the trails for a thrilling safari. Travelling across the lake and exploring the forests will give you such a sense of what a remarkable area you are in and how remote the village of Nellim is. Lunch will be cooked on an open fire. In total you will be out for around 4 hours today. You will travel two people per snowmobile and will have the chance to swap drivers (all drivers must be over 18 and have a full driving licence). After dinner tonight it is time to visit one of Nellim’s Aurora Camps as you travel by snowmobile-pulled sleigh to a remote Northern Lights viewpoint. Fingers crossed the Northern Lights will add their own illumination to the glow of your campfire. You will be out for around 2.5 hrs. One of the highlights of any holiday in this region must be a dog sled safari. For many, this is the experience which is most synonymous with the Arctic. You will be given a safety briefing and full instruction on how to handle a dog sled and your team, before you head to the husky camp a short distance from the hotel. The reason your instructions are provided away from the animals is that they are sure to make a cacophony of noise prior to departure, as they are so excited for the trail. Once you have been allocated your teams, you will set off travelling in pairs (one driving and one enjoying the views from the sled). The huskies fall silent as soon as they set off as they are totally focused on the task at hand, leaving you to enjoy the peace and quiet. This is an experience that is not easily forgotten and is a magical way to travel. Back at the camp you will have time to take some pictures with the huskies and ask any questions you may have about these wonderful working dogs. The total experience lasts around 2 hours and lunch will be served back the hotel. As you have another free evening, we strongly recommend a walk to one of the lakes to enjoy the views of the sky. Many a guest (and Aurora Zone staff member) has enjoyed staggering displays of the Northern Lights from these spots, and with luck, the Aurora will bid you farewell this evening. Alternatively, you may wish to book additional activities. Please speak to one of our Travel Experts or see the ‘personalise’ section for details. 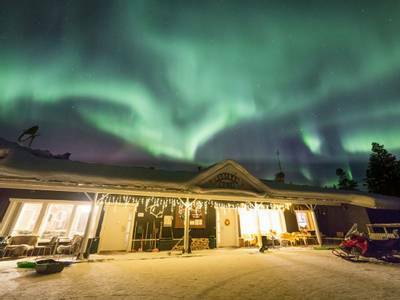 You may also like to consider spending the night in an Aurora Bubble or Aurora Kota here at Nellim – a fabulous way to end the holiday (see 'Personalise' section for details). Please note that as the final order of activities will be confirmed on arrival, the kota cannot be guaranteed to be booked on a night with no activities, but you’ll still be able to enjoy plenty of time in the accommodation after any activities. Today is sadly departure day and you will be transferred back to the airport to catch your return flights. If you are on an early flight you will be provided with a packed breakfast. 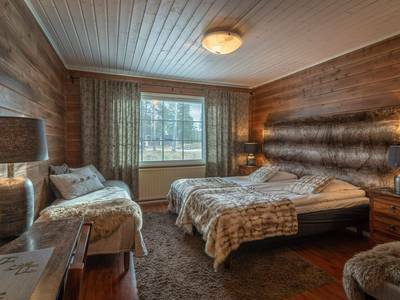 As ever, Muotka leads the way in Aurora viewing innovation and we are therefore proud to offer our guests the chance to spend the night in one of the magnificent Aurora cabin whilst staying at either Muotka or Nellim. These stunning, part-cabin, part-glass tepee buildings, offer guests an exceptional overnight Aurora hunting experience. Guests get the space and feel of a cabin during the day and the Aurora viewing benefits of a glass igloo at night, as you sleep under a glass tepee. This means that you are provided with the most wonderful views of the night sky from the comfort of your bed. These part-cabin and part-glass tepee buildings, are self-contained and situated a short distance from the hotel, next to the annexe. They combine the space and atmosphere of a cosy cabin with a glass roof above the bed. Each cabin faces north so ideal for guests to gaze upon the night sky every night of their holiday, from the comfort of their duvet. The cabins are all 25 sq. 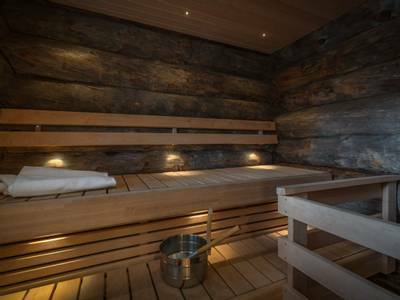 meters with their own private sauna, double bed and en-suite bathroom, making them an excellent base. Please note an additional supplement will apply on our Christmas and New Year departures. In the city itself, Senate Square is the main feature, showcasing neoclassical architecture and offering easy access to the surrounding shops. With Helsinki once part of the duchy of Russia, it offers similar striking architecture, with wide streets and bold facades. For those looking for more of an insight into the city's past, we would suggest visiting the Ateneum Art Museum which houses over 20,000 pieces of art, or the Helsinki Design Museum which showcases the history of design in the country from traditional folklore to postmodernism. 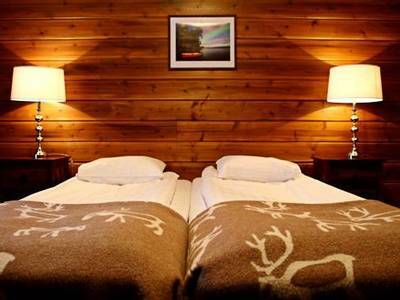 The single adult price is based on a single room but a shared transfer and snowmobile. If you would prefer to drive your own snowmobile please speak to our Travel Experts for the supplement. Everything worked very smoothly and the staff at both Muotka and Nellim were very helpful and friendly. Dog sledding. A completely new experience for me. Added bonus of petting the St Bernard and the Husky puppies after the ride. The Muotka hotel is amazing, the people that are working are very nice. Special mention to Matt, the aurora zone representative: he is very nice and the organization of the activities, groups, info, and kindness made the Muotkan experience quite pleasant. The local guides Yanni, Tia and Matt are also amazing people, kind, funny. Everything worked well and went to plan. Everything met or exceeded our expectations, so was a really good trip. Even the northern lights put on a great display while there. I enjoyed every part of my stay. The scenery was magical and everything ran smoothly. Read more relaxed atmosphere to the whole place. Read more done and thank you! Read more Robinson, the rep at Muotka, was brilliant, particularly his knowledge and explanations of the Aurora (to see which was principally why we had gone). He also made sure we were being properly looked after and enjoying ourselves; and took some excellent photographs. We particularly enjoyed the husky safari, provided at Nellim. Driving silently through the snowfields of Lake Inari and the surrounding woodlands was magical. It was an excellent holiday which we really enjoyed. That was helped by the three displays of Northern Lights and by the unusually heavy snowfall which had happened the night before and morning of our arrival which made everything look amazing. What an amazing experience, we booked this trip for our honeymoon and it will be an experience we won’t forget in a hurry. Staff were well informed, friendly and attentive to your needs adding to the overall experience. Keep doing what you are doing because it works. Read more quite a different feel from the atmospheric forest at Muotka to the vast frozen lake at Nellim.The advice and help given by you all at Aurora Zone was superb and we wouldn't hesitate to highly recommend this holiday. The perfect trip :) Snowmobiling and the huskies were the favourites because it gives you a chance to see the beautiful back country. Read more JUST EVERYTHING. Don't change anything. Just fabulous - Thank you! From the moment we booked to the moment we left Nellim to go home, everything ran like clockwork. Most enjoyable? : HUSKY driving of course!!!!!! But NOTHING can beat the magnificent Northern Lights display we witnessed on Thursday 10th March. Out of this world. All went without a hitch and we had a splendid night watching the Aurora at Nellim. The trip including a trip to the Russian border was welcomed. Your admin team were always so kind and helpful; nothing was too much trouble answering some small queries of mine. Again, very impressive. An amazing, fun experience from start to finish but the pinnacle has to be the Aurora Borealis which danced and danced, and danced. Read more enjoyable and worthwhile. Fantastic holiday, well organised and will definitely recommend. The staff were wonderful, especially Robin, Niina and Minga at Muotka. Barry on the sales team went out of his way to get us booked before Christmas. The husky safari was wonderful. As a dog trainer, it was so fun to see the dogs doing what they were bred to do. And the Aurora made a splendid appearance, which was fantastic. Read more Snowshoeing in the National Park at Muotka. Snowmobiling on the lake at Nellim. Husky dogs in a snow blizzard!